The trio of Canadian teenagers at the Miami Open have a 8-1 record through the first three rounds. Félix Auger-Aliassime (3-0) and Denis Shapovalov (2-0) have reached the round-of-16, as did Bianca Andreescu (3-1) before she lost 6-1, 2-0 ret. to Anett Kontaveit on Monday. Her ailing right shoulder prevented her from continuing in the match. That cumulative 8-1 for young Canadians seems impressive but just two weeks earlier at the BNP Paribas Open in Indian Wells the same three wound up at 11-2 as Andreescu won the title (7-0), Auger-Aliassime (2-1) went to the third round and Shapovalov (2-1) reached the round-of-16. Andreescu deservedly got most of the attention because she won the title in Indian Wells, the biggest ever by a Canadian female or male. The only international victory of comparable status would be Lorne Main’s 1954 win in Monte Carlo. But the Monte Carlo field that year was missing a lot of big names and wasn’t quite as prestigious then as Indian Wells is now – arguably the most important regular tour event below the four Grand Slams. It was tough to see Andreescu unable to give her best against an in-form, No. 17-ranked Kontaveit on Monday but she was fortunate to have gotten as far as she did. In the first round last Thursday, she had to stage a gutsy rally from a 5-1 deficit (and a match point trailing 5-2) in the second set to get past Irina-Camelia Begu 4-6, 7-6(2), 6-2. It’s been a phenomenal 2019 for Andreescu – runner-up in Auckland, qualifying and second round at the Aussie Open, title at the WTA $125K event in Newport Beach, semi-final in Acapulco and then her successes in Indian Wells and Miami. She has a 31-4 match record and has beaten 10 top-40 players, including four in the top-10 – Caroline Wozniacki (3), Elina Svitolina (6), Angelique Kerber (8) and Kerber (4) – as well as the biggest name of them all, No. 38 Venus Williams. Her ranking, at age 18 (19 in June), has risen from No. 152 at the end of 2018, and from No. 60 before Indian Wells, to No. 24 (No. 23 if Hsieh Su-Wei loses to Kontaveit in the Miami quarter-finals) and should certainly be even higher by the end of 2019. 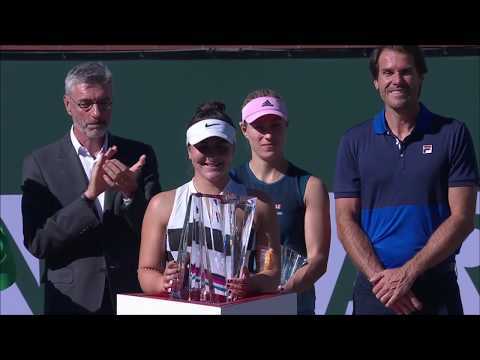 2019: Bianca Andreescu (18-19) – No. 152 to No. 24. 2019: Félix Auger Aliassime (18-19) – No. 109 to current live ranking No. 46. 2017: Denis Shapovalov (17-18) – No. 250 to No. 51. Andreescu and Auger-Aliassime still have about seven months in 2019 to significantly improve their rankings. After her initial disappointment following Monday’s loss at the Miami Open, Andreescu was able to put her recent achievements into perspective. She will now take a break until the weekend of April 20-21 when she will lead the Canadian Fed Cup team traveling to Prostejov in Czech Republic to play on indoor clay in a World Group Playoff. Beyond the Fed Cup weekend, she’s unsure of her schedule but there’s a slight chance she could be given a wild card into the WTA Premier indoor clay-court event in Stuttgart the week following Fed Cup. That’s the tournament where Maria Sharapova made her return from her drug suspension in 2017. Tuesday shapes up as another fascinating day at the Miami Open as the 19-year-old Shapovalov (20 next month) goes for his third Masters 1000 quarter-final (semi-finals in Madrid 2018 and Montreal 2017) matched against old junior rival Stefanos Tsitsipas. Their head-to-head is 1-1 with Shapovalov defeating the 20-year-old Greek 6-1, 6-3, 7-6(5) in the first round of the 2018 Aussie Open and qualifier Tsitsipas winning 6-3, 6-4 three months later in Monte Carlo in Shapovalov’s first match of the season on clay. It’s somewhat ironic that the then No. 27-ranked Tsitsipas made his big breakthrough by defeating four top-10 players on his way to the final of the Rogers Cup in Toronto – Shapovalov’s hometown event – last August. Later in the year he won his first ATP Tour title in Stockholm and then upset Roger Federer in the round-of-16 at the 2019 Australian Open on his way to the semi-finals (Rafael Nadal). He also won his second career title in Marseille in February and then lost to Federer in the final in Dubai a week later. That got him to No. 10 in the rankings. In the meantime, Shapovalov, No. 26 at the time of the 2018 Rogers Cup, has maintained a steady ranking in the mid-20s and is currently back at his career high of No. 23. The results of the past year weigh in Tsitsipas’ favour for Tuesday evening’s match-up but a more recent result should give Shapovalov confidence – his pal Auger-Aliassime beating Tsitsipas decisively 6-4, 6-2 in the Indian Wells second round two weeks ago with the Greek looking a little shaky. Auger-Aliassime had defeated Tsitsipas the three times they had previously faced each other as juniors and many wondered if that had been a factor in the outcome. As it was with the Auger-Aliassime – Tsitsipas contest in Indian Wells, Tsitsipas vs. Shapovalov in Miami surely showcases one or two future Grand Slam champions. So it has to qualify as a buttery popcorn match. The encounter is Tuesday not before 7 p.m. in the Grandstand. While Shapovalov – Tsitsipas is a confrontation of peers, Auger-Aliassime’s round-of-16 against Nikoloz Basilashvili of Georgia is more the rookie against the veteran. Auger-Aliassime, 18, scored his first ATP Tour match win a little over a year ago in Indian Wells, beating compatriot Pospisil. As for Basilashvili, 27, he was a late bloomer – not winning a tour match until he was 22 in 2014. But he has come on strong as his ranking moved from No. 192 in 2014 to No. 104 in 2015, then to No. 94 (2016), No. 59 (2017), No. 21 (2018) and finally to its current No. 19. The 6-foot-1 Georgian won titles last year at two ATP 500 events – in Hamburg on clay and Beijing on hard courts. He’s married and has a three-year-old son. His coach is the German Jan De Witt, who has worked with Gilles Simon, Gael Monfils, Viktor Troicki and Andrea Petkovic among others. It’s a first meeting between Basilashvili and Auger-Aliassime. Both are heavy hitters and the match will be a good test for the 6-foot-4 Montrealer as he attempts to reach his first Masters 1000 quarter-final. Basilashvili has an 8-15 record at Masters 1000s. Cincinnati in 2018 (third round) and this year in Miami (fourth round) are the only times he has won more than one match at a Masters 1000. Deviated septum surgery involves repositioning the bone and cartilage that separate the two nostrils. Schnur, 23, currently ranks No. 109.